There wasn’t much experimenting here,folks. 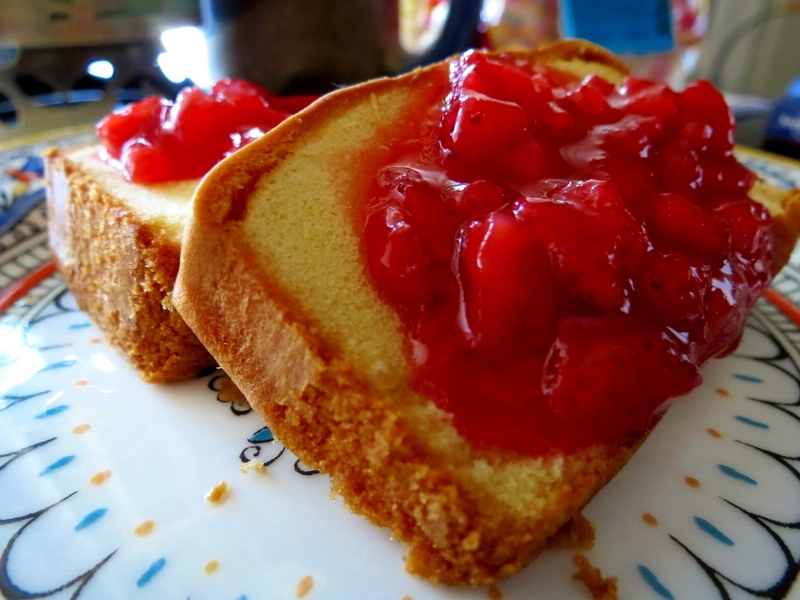 I had a craving for pound cake (because I saw Paula Deen making it on TV last week) and I had about three baskets of ridiculously sweet strawberries that I needed to put to good use. I was originally going to make a strawberry pie,but after thinking about that fluffy,buttery cake, I knew what had to be done. I stayed pretty true to Martha Stewart’s Classic Pound Cake Recipe, except I cut all the measurements in half as to only make one pound cake loaf. You can follow the recipe verbatim here— but if you’re feeling crazy, add the zest of a small lemon into the batter for a refreshing little bite. For the strawberry glaze, I borrowed from a Strawberry Pie recipe I found via Browned-Eyed Baker and adapted it slightly. 3. Heat strawberries with lemon juice in saucepan over medium heat, stirring constantly. After about a minute, add sugar, water, salt, and additional cornstarch; stirring until well incorporated. 4. Remove from heat and let cool completely. Store in air-tight glass jar until ready to use. This makes a great filling for small tarts and goes well on top of pound cake, cheesecake, and on top of warm beignets or aebelskivers.